Choose which of your social accounts you authorize Edgar to publish this post to. Accounts must be selected to publish a post. If a post isn't relevant to a certain account, simply don't select that account on it. You can select as many Facebook and LinkedIn accounts as you'd like. However, you may only select one Twitter account per post due to Twitter's policies. 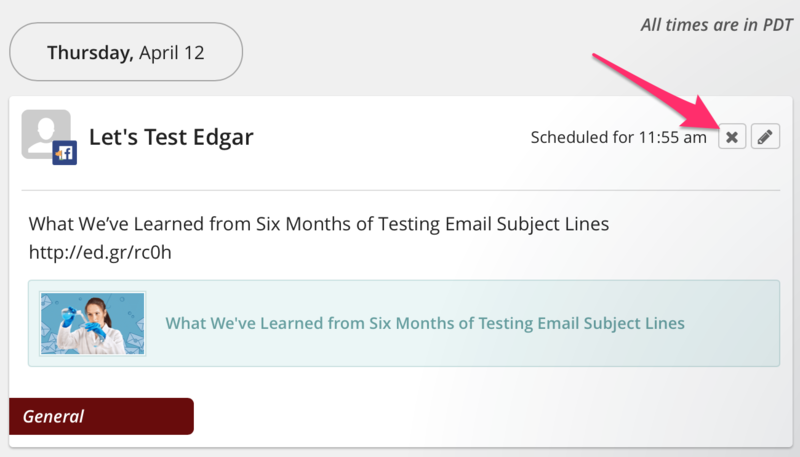 Additional social media accounts can be connected to Edgar on the Accounts page. 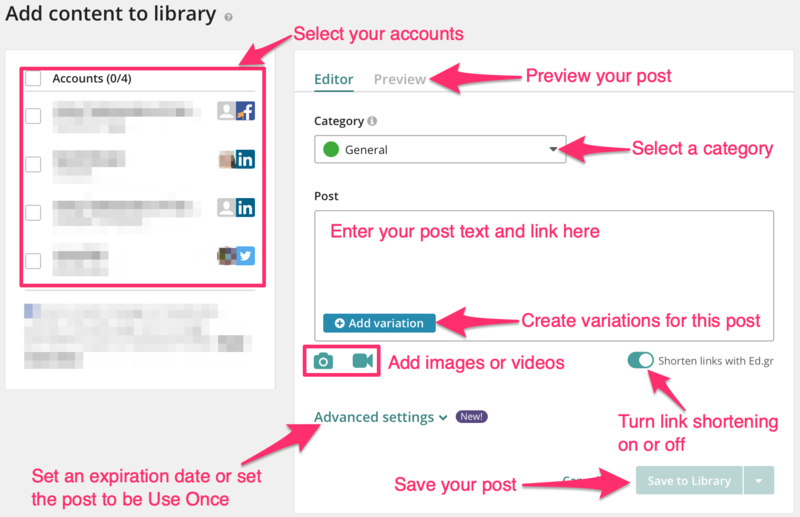 On the Editor tab, select the category you'd like the post to be saved to, enter your post text and link(s), upload any images or video you'd like, and make changes to your link shortening or Advanced Settings, if desired. 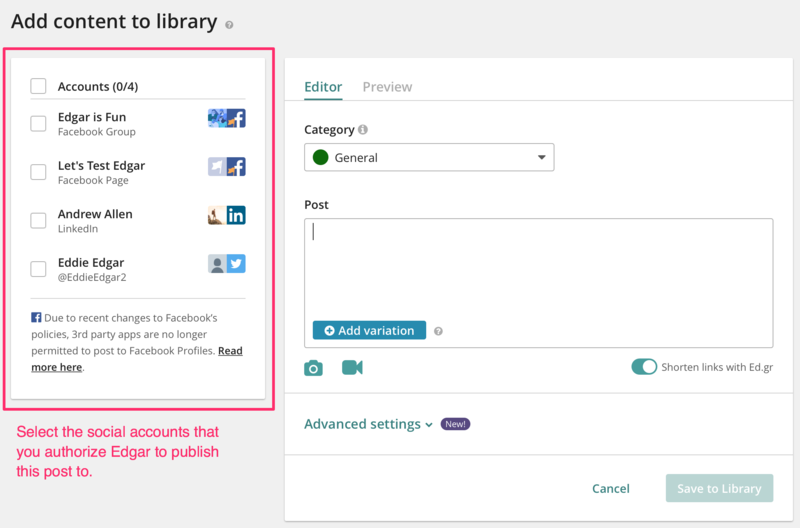 To create additional variations of your post, click the Add Variation button or use Edgar's Auto-variation feature. Posts for Twitter can have a maximum of 280 characters, and post to LinkedIn can have a maximum of 700 characters. You may upload up to 4 images for a Twitter post and up to 20 images for a Facebook post. LinkedIn posts may have only 1 image. 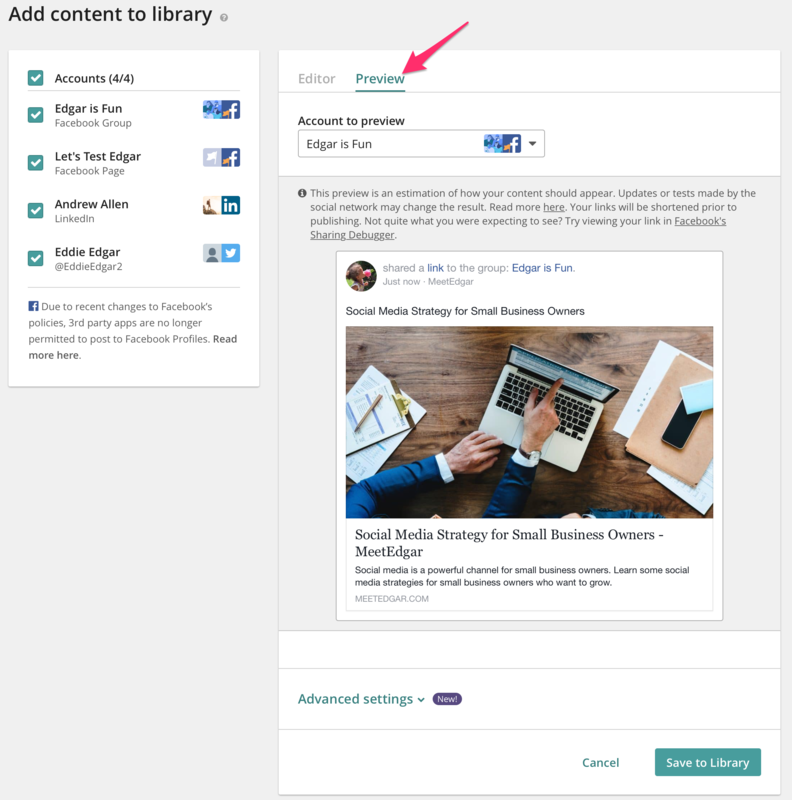 After you create your post, click the Preview tab to see what your post will look like on the social networks. Use the drop down menus to preview different accounts or variations. When you're finished making changes, click ‘Save to Library’. Notes: Edgar's previews are approximations of what the social networks will display. Each network will create their own preview at the time the post is published. The Advanced Settings allow you to designate a post as Use Once or set an expiration date on the post. Learn more: Advanced Settings. 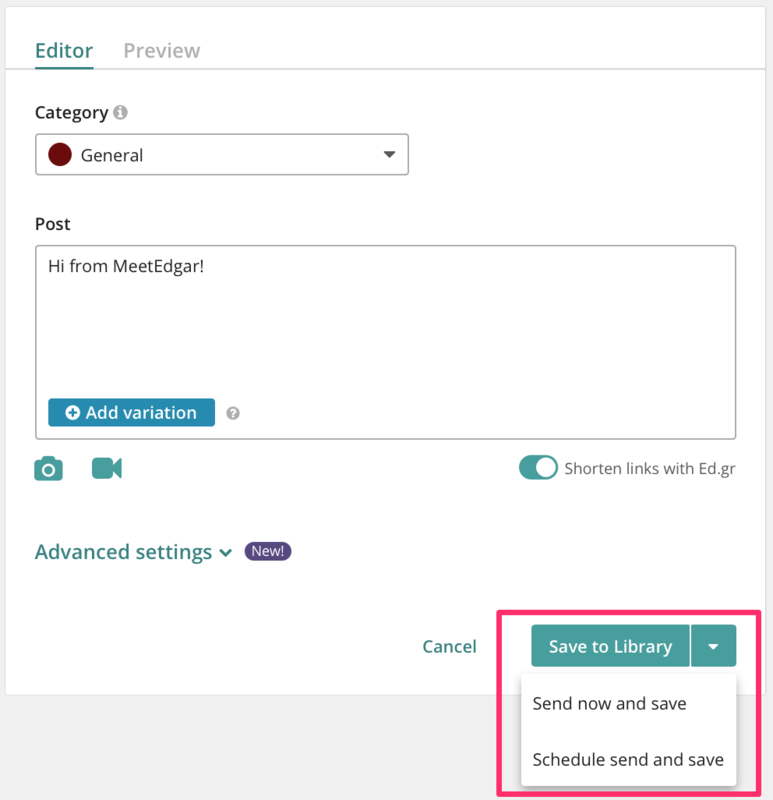 When saving your posts, you have 3 options: Save to Library, Send Now and Save, or Schedule Send and Save. Clicking Save to Library will save the post to the category you selected. The post will publish according to the time slots on your schedule. Clicking Send Now and Save will publish the post to your social networks one minute after you click the button. The post will also be saved to your Library and will be published in the future according to the time slots on your schedule (with the exception of Twitter). 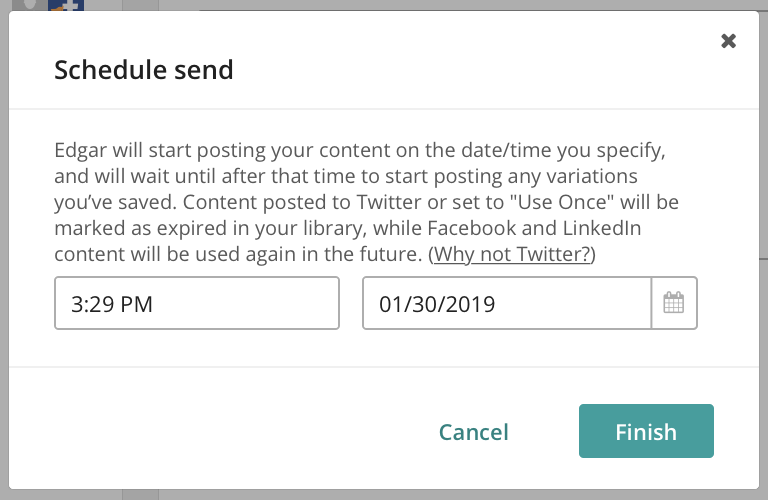 Clicking Schedule Send and Save will give you the option to set a specific date and time in the future for the post to be published. The post will be held until the date and time you choose, when it will be published to your social networks. Once it publishes at that time, the post will go back into the regular rotation for that category and be published according to the time slots on your schedule (with the exception of Twitter). 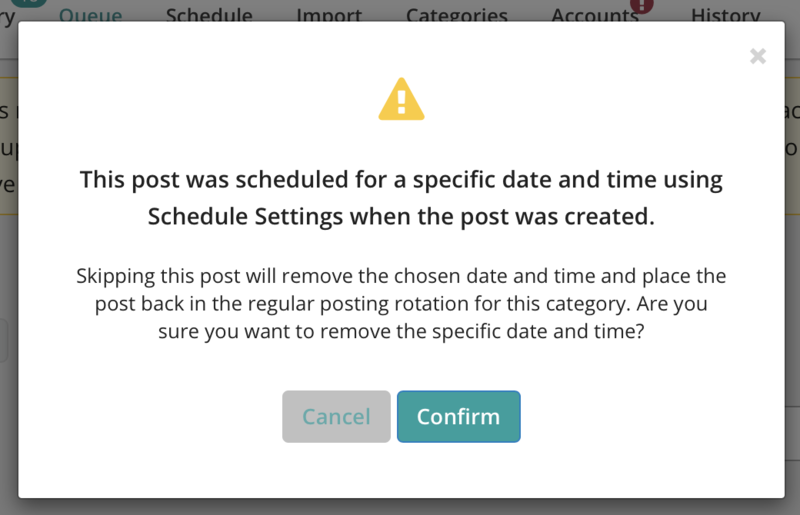 If you decide you do not want to send this post at that date and time, you can click the X button and confirm that you'd like to remove the specific date and time.